We want to let everyone know about Capital Flash Camp! 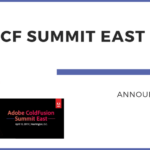 Capital Flash Camp is a full-day event focusing on the Adobe Flash Platform that will be held on April 16 in Washington, D.C. Enhance your skills in ActionScript and Flex while learning from local and national industry experts. Flash Camp will provide an introduction to the Flash Platform as well as covering advanced topics for existing Flex and ActionScript developers. In addition to great training, this is also a fabulous venue for networking with other developers in the community. Reserve your seat now at a *special $20 discount* for TeraTech clients and customers.